Ready for some great classes? I’ve got two fun ones coming in¬†November and December! In November I’m teaching an Intro to Brioche class on Sunday, November 13 from 1:30 to 3:30. In December I’m teaching a Knitalong class for Iris Schreier’s¬†gorgeous Key of Life¬†- ¬†That class will be two Sundays, December 4th and 11th, 1:30 to 3:30. A few techniques you will study with this project: garter stitch tab cast-on, short rows, knitting in ends as you go, tricks¬†for working two-color stripes and three-needle bind off. And of course there will be secret tips and tricks. Stop in the shop or give a call at 425-242-0086 to register for¬†a class. Even Nancy Marchant was impressed! Looking forward to meeting her at Madrona next month. Will you be there? Come see my free Fox Paws Demo in the rotunda Thursday afternoon or message me so we can connect! Fox Paws Mini-class at Madrona – registration is open! Madrona Fiber Arts retreat mini-class registration is open!I’m teaching Fox Paws Foundations. Hi Friends! Exciting classes, including some freebies, coming up in the next few months. Please register! Excited to knit with you. Also, see above, a new feature called “teaching calendar” so you can stay up to date! Brioche stitch in two colors! Wow! So beautiful!¬†Students must be familiar with knitting brioche stitch. Check out the Serial Knitters website for the most up-do-date info on classes offered in the Kirkland, WA shop. Fox Paws Foundations – mini-class at the Madrona Fiber Arts Winter Retreat,¬†FEBRUARY 11-14, 2016,¬†Hotel Murano, Tacoma, Washington. (Mini-Class Schedule is released in January 2016. – Sign up for updates on their page to get the latest information.) I’ll also be doing a free Fox Paws Q & A in the rotunda at Madrona – more details to follow. Help is at hand. Join Pamela Grossman for Fox Paws Foundations to learn the unusual stitch patterns and techniques used in Fox Paws. 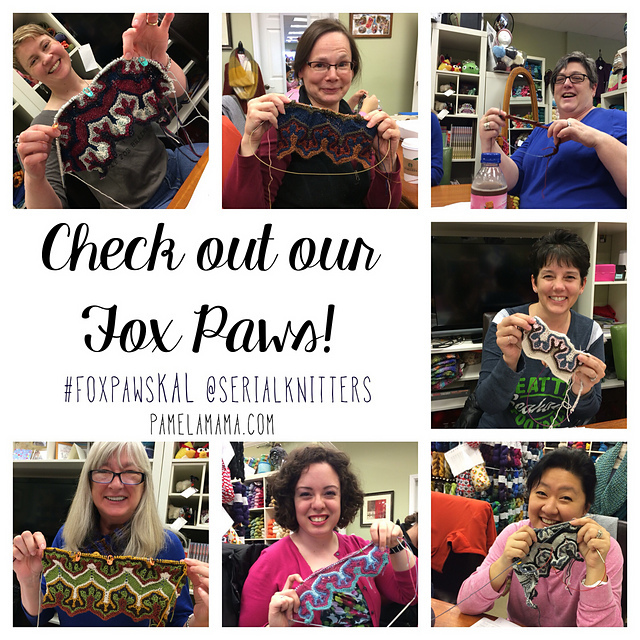 To prepare for her Fox Paws workshops at Serial Knitters in Kirkland, WA, Pamela undertook an in-depth study of the pattern devising tips and strategies to help knitters truly understand the compelling but tricky stacked increases and decreases. She collaborated with Xandy while developing the workshop plan. We‚Äôll also get an overview of the video playlist that Pamela has organized to support Fox Paws.¬† If time allows, we will review the Fox Paws pattern itself alongside Pamela‚Äôs ‚ÄúFox Paws Cheat Sheet‚Äù ‚Äì an unofficial guide to parsing the pattern and remaining calm despite the challenges of the dreaded, feared and adored row 6. Medium-weight (DK, sport or worsted), bouncy scrap yarn. Pick something with some stretch to it. It‚Äôs nice to have a few colors for experimenting. Weight doesn‚Äôt matter, just pick something that is comfortable for you. Needles to match. (Size 7 or 8 or whatever you use for medium weight yarn.) You may want to bring a few different types to see what works best. Wood needles can be tricky for this project as there is a lot of stress on the needles and some have experienced breakage. Circulars are suggested because of the flexible cable. The usual notions and tools, stitch markers, scissors, etc. Cast on 25 stitches with a medium weight yarn and matching needles. Knit two rows garter stitch. NOTE: We will not have time in this session to do an in-depth study of Xandy‚Äôs pattern. Pamela will be able share her cheat sheet, video playlist and other resources. Interested in a class you don’t see or a private¬†lesson? Email pamelamama at gmail.com or give a call over to Serial Knitters:425-242-0086. Want to hire Pamela to teach a class at your venue? Email! See lots more pictures in my Ravelry store! Yep I named it with a hashtag right in the title. Against all realistic odds I have released a new pattern for your enjoyment! 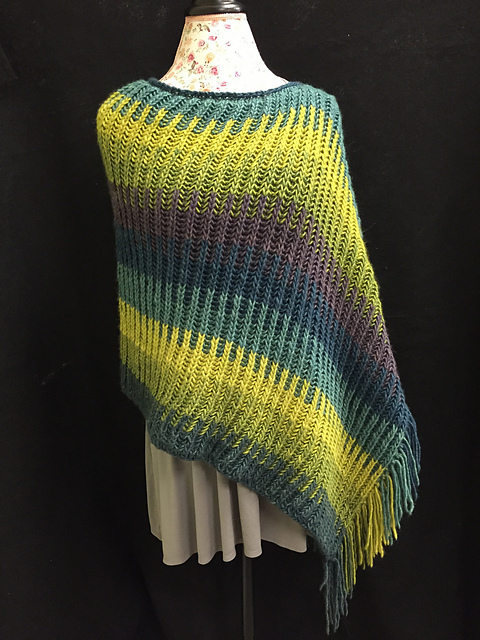 The #CeliaStrong Poncho is¬†a cushy asymmetrical multi-color cancer-fighting brioche poncho knit in the round with minimal seaming and built-in extremely fashionable fringe. Everything you could have possibly wanted in a knit. Make it now before the wheel of style turns and dictates we can only use it as a cozy blanket. Celia is a 16-year-old friend fighting cancer. I wanted to make her a poncho because ponchos are in right now and we are stylish people. It came out pretty amazing. So, here‚Äôs the pattern. Thanks for the inspiration, Celia! 50% of the proceeds from the sales of this pattern will go to the cancer research organization of my choice. The other 50% will probably buy yarn. This lofty, cozy brioche poncho is knit in the round using one color at a time. No carrying colors is needed. After knitting the whole thing as a tube, finish by creating the head opening with a three-needle bind off. A 10-stitch stockinette panel is dropped, cut and tied off to create fringe along one edge. Built-in fringe! No tying on hundreds of short strands! For extra fun, I’d love it if you’d tag your project photos with #CeliaStrong #ponchostrong and of course, #teambrioche! Brioche knitting, casting on, three-needle binding off, knitting in the round, being completely awesome. Remember how you wanted my help with your knitting project? You have some gorgeous yarn but aren’t sure what to make from it? You have a great pattern but you don’t know what yarn will work well? You are ready to start a new project but you wish you knew someone who has knit it before so they could give you some tips? Do you know that there is a free and wonderful website that you can use to help you with all of these situations? It’s called Ravelry! I’m teaching a class in the basics of Ravelry which can solve all of those problems and more. Interested? Are you on Ravelry.com? This free website is a rich resource that connects you to the online world of knitting and crocheting, spinning, weaving, dyeing‚Ä¶ etc! It‚Äôs a social network for yarny folks, and so much more. You can search for ideas and inspiration‚Ä¶ find a pattern to use your stash yarn, explore projects made by others and see tips and reviews of patterns and yarns. Before you jump into your next project, get advice from knitters who have been there, done that and lived to tell the tale. You can join in crafty conversations of every variety. Connect with your real-life friends and make new virtual yarn-loving buddies. We will learn how to create an account, navigate different areas of the site, search for patterns and projects, connect with friends, see what patterns are popular and upload the details of your projects to share with other Ravelers. We‚Äôll explore privacy settings, groups and forums. If time allows we‚Äôll also have a peek at Instagram and Pinterest. A device that can connect to the internet, like a laptop or a tablet. Phones are not ideal because of the small screen size and keyboard. Pamela is a patient teacher who is happy to hold the hand of any technophobes who are ready to take the plunge. Contact the shop to sign up! Hey Knitters! Here’s a flyer describing my summer offerings at Serial Knitters. I’m also available for private knitting instruction through the shop. I can do classes in English or ASL! Any other classes you’d like to see? Let me know! They are looking so beautiful and we are all grateful to Xandy Peters for this great pattern. For those of you who couldn’t make the session, post your progress pictures in the Serial Knitters Ravelry discussion forum here: Picture Thread. Workshop Series $75 – ¬†Sundays, May 3, 24, &¬†31 from 1:30 – 3:30pm. Loads more information on the shop website. 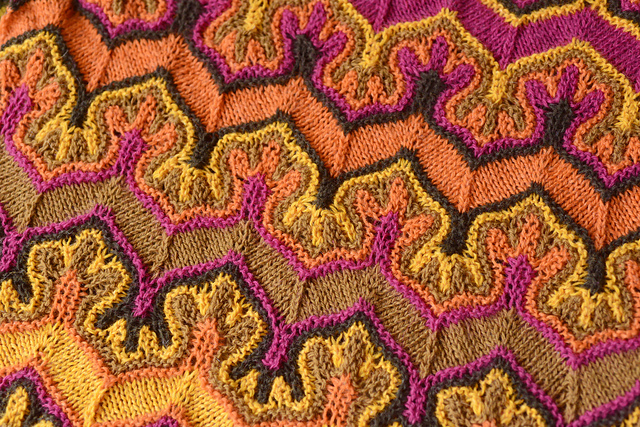 In other knitting news I am completely obsessed with the idea of combining three¬†things I love: gorgeous long-color-changing Spincycle Yarn, mathematically inspiring mobius knitting and complex and beautiful stitchwork in two-color brioche. Oh, and then there’s a fourth element I’d like to experiment with:¬†combining different yarn weights in the same project to create unexpected fabric. Find lots more¬†pictures of my experiments on my Instagram page. Love to hear your feedback! Happy knitting!